Rehlat – one of the fastest growing travel websites in the Middle East, offers wide range of cheap flights to Kuwait including one-way or round trip as well as provides daily schedules & information on non-stop flights to Kuwait. Choose from the best selection of low cost flights to Kuwait from all around the world. Find dozens of travel deals and cashback offers only with Rehlat. Kuwait boasts of several budget hotels and has many state-of-the-art 5-star luxury hotels that offer an engaging environment and exceptional culinary experiences to their guests. Apart from a host of contemporary amenities like fitness centers, Wi-Fi, bed and breakfast benefits, most of the Kuwait Hotels have world-class hospitality combined with scenic outside views to delight the guests. 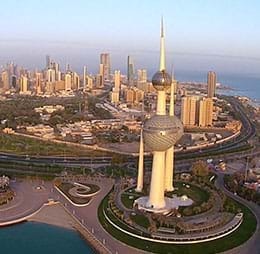 Book Cheap Flight to Kuwait with affordable fares to Kuwait City. The quick and easy way to find the lowest fares on tickets to Kuwait Flights.